Does this sound familiar? You have a fun and boisterous character to play, and you are looking for that perfect 1960s beehive, but you don't want a typical wig that everyone else seems to wear. You want something a bit more into the1960's mode like the Vamp Wig by Lacey. This wig could be just the right look for you: with an extra- large beehive, this very exaggerated style is fun and daring. 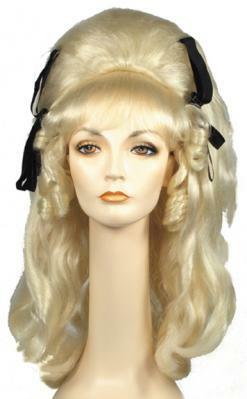 It includes a ribbon on either side and curls around the face, with very long cascading locks. Everyone will love this look!